Accessibility for New England is a proud authorized supplier & certified installer of EZ Access Wheelchair Ramps for both residential, commerical & portable access solutions. A low maintenance modular ramp installed by Accessibility For New England will give you years of service with very low maintenance. The high-grade extruded aluminum will not rust, rot, or decay. The EZ Access ramping system installed by Accessibility For New England can meet ADA guidelines and can be installed in less than a day in most cases. 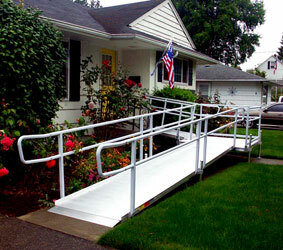 Most of the modular ramps have an 850 pound capacity. Best of all they are made in America!